Are you fed up of losing your keys? How often does it happen? More often than you want to, I suspect, and normally when you’re in a rush. This handy little device - the Beets BLU key finder - can help you stop losing your keys. For £20, this Bluetooth tag is designed to sit on your keyring and alert you via a series of beeps when you’ve lost your keys. As with all things these days, you need to download an app to your phone which you then utilise to set the beeper off. Fortunately, the app is available for both Android and iPhone, so the majority of smartphone users will be able to use this gadget. I was initially a little dismayed when this came through the post, but only because I didn’t feel as though the instructions were overly clear. Not that I needed to worry, as, despite the instructions being fairly limited, they were easy enough to follow. I have a Samsung S6 Edge phone (Android) and pairing this with the Bluetooth device was fairly easy. Originally I thought that I may attach the tag to my keyring as suggested, but I have since attached it to my daughter’s phone. Why? Simply because she loses it in the house so often that we can still find it - even if it is off or with a dead battery - without having to turn the entire house upside down. 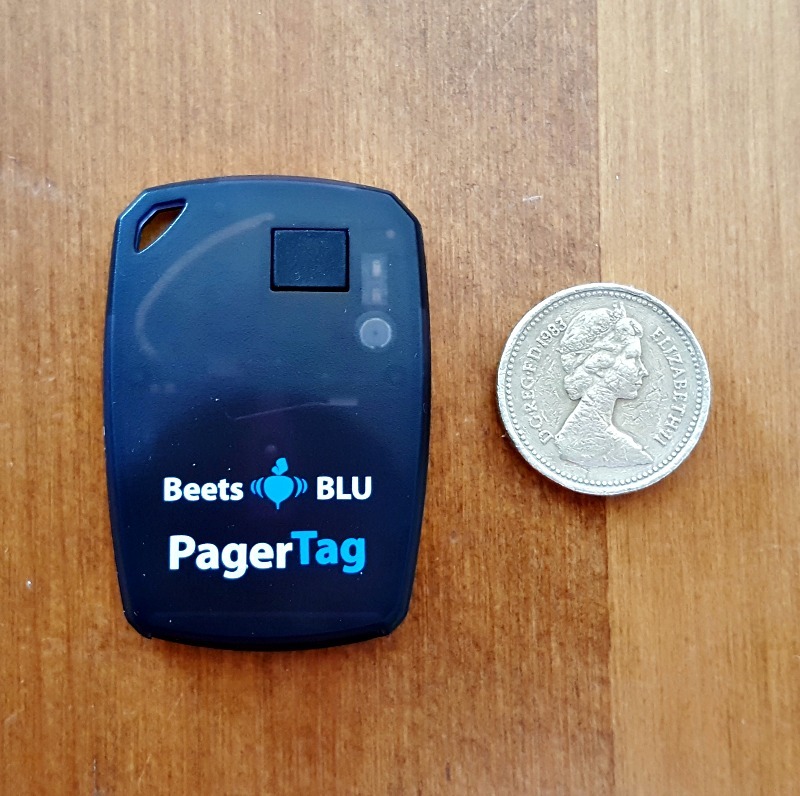 The Beets BLU Pager Tag key finder alongside a pound coin for scale. As you can see, the tag is slightly thicker than a £1 coin and roughly the length of two £1 coins stood one on top of the other. It’s small enough to not be bulky, blending in nicely with a bunch of keys, though it is certainly more noticeable when it’s attached to a phone case. The tag itself is designed nicely, looking stylish and sleek, and seeing as it seems to do exactly what it says, it gets five stars from me for the review. If you’re fed up losing your keys, then you can buy the Beets BLU key finder at Amazon for just £20 at the time of writing. Beets BLU Pager Tag key finder showing another angle. Pound coin for scale again. I received this key finder in exchange for an honest review. All opinions are mine. I used to be terrible at losing my keys! If only the key finder was around when I was about 16/17 I always lost my keys at that age lol! Awesome! I think it is very useful aside from the rush especially those who tend to forget keys or phone. I need this! I lose my keys all the time – though generally in the tardis that is my handbag!! This is a brilliant idea. I am always losing and looking for my phone which is always on silence at home to the annoyance of everyone. Like your daughter, this will come really handy for me. I just saw the commercial for this. Sounds like something I think I might need to get. WOW that sounds really interesting. I can think of a ton of people would benefit from this. I’m famous for losing my keys, credit cards, etc. Perfect for people who spend a lot of time worrying about losing their keys. This is a sure KEY to their happiness.